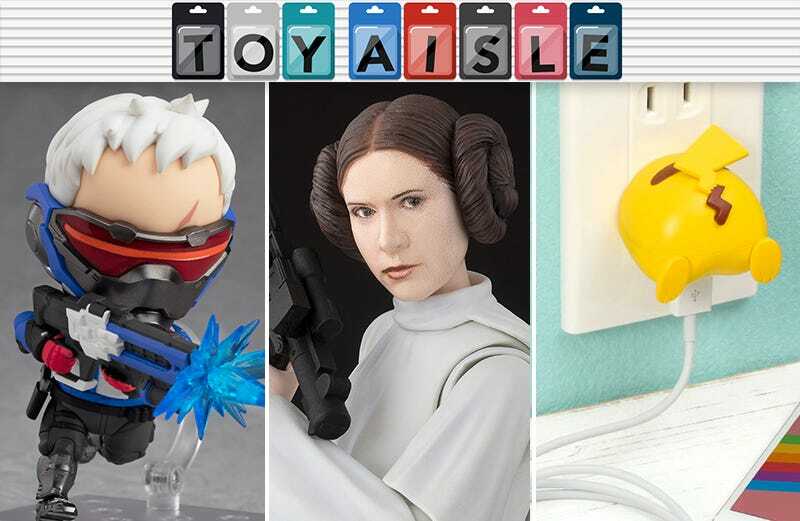 Welcome back to Toy Aisle, io9's weekly round up of the most delightful toys we’ve seen tempting our savings accounts on the internet. This week: S.H. Figurarts finally brings Princess Leia to its Star Wars line, Overwatch’s best dad gets the chibi treatment, and honest to god Pokébutts. Check it out! You’ll have to squint to see Carrie Fisher in this new Princess Leia figure from S.H. Figuarts, but what it lacks in an accurate face sculpt, it makes up for with a fantastic amount of articulation that manages to work around the flowing robes she wore in the original Star Wars. Arriving in December for about $56, the figure also includes a pair of weapons, including an E-11 Stormtrooper blaster, as well as an optional snap-on hood accessory. First there was the ‘80s-era video game you might have played on an ancient Apple computer at school, and more recently a handheld version of The Oregon Trail let you dodge dysentery on your commute to work. Pressman Toy is now turning the classic game of survival and river crossings into a new board/card game that has players shepherding their families and supplies from Independence to Willamette Valley. Like with the electronic version, the $40 Target-exclusive game comes with the very real risk of losing your imaginary family members along the way. But this is the first version of The Oregon Trail that lets you compete head-to-head with other pioneer families trying to traverse the same dangerous route. Remember those shiny-spined Little Golden Books you read as a child that introduced you to classic nursery rhymes and fables? They’re now finding new places to source their stories—namely pop culture—including a new Star Trek collection arriving in early 2019. Who says that in another 50 years the tale of the Enterprise won’t be just as popular with kids as hearing about Humpty Dumpty? Both I Am Captain Kirk and I Am Mr. Spock will be available for just $5, and we’re keeping our fingers crossed for both Uhura and Sulu getting their own books as well. Last year a Pokémon-themed charger appeared featuring an unfortunately placed USB port that couldn’t have been comfortable for Pikachu. It was, not surprisingly, not an official Nintendo product—but this one is. Available now in Japan for about $20, this charger puts a pair of pop-up prongs on Pikachu’s lower torso, and moves the USB port to the pocket monster’s crotch area, which we’re not entirely sure is an improvement. Apparently this is the first of an entire line of Pokémon USB chargers still to come, but we’re wondering why Nintendo didn’t make it powerful enough to properly charge the Switch? Good Smile’s line of Overwatch-based Nendoroid figures has given us incredibly cute takes on everyone from Widowmaker to Genji, but there’s perhaps nothing more adorable than turning everyone’s favorite curmudgeonly Overwatch dad—old hero turned grim mercenary Jack Morrison, better known as Soldier: 76—into the most adorably angry little baby. It’s a harsh reality to accept, but you’re never getting a hoverboard; Back to the Future II straight up lied to you. Even if the technology ever comes to fruition, hoverboards will be too dangerous to be sold to kids, or childlike adults, as toys. The runner-up prize might be Air Hogs new Extreme Air Board, which lets you live out your Marty McFly fantasies with a tiny action figure you strap to a flying RC drone. You don’t need to be a time-traveling cube-gleamer to master this $40 hoverboard, though; it comes with ‘Flight Assist’ technology for easy, one-button take-offs and landings, and five Tony Hawk-worthy tricks.